The Extreme Portable SSD’s convenient form factor trumps the drive’s slight performance deficit compared to the Samsung T5. With its fast USB 3.1 Gen 2 (10Gbps) capability, this is currently our favorite portable SSD. Though a tad slower than Samsung’s T5, this portable SSD’s physical design makes it a better travel companion. 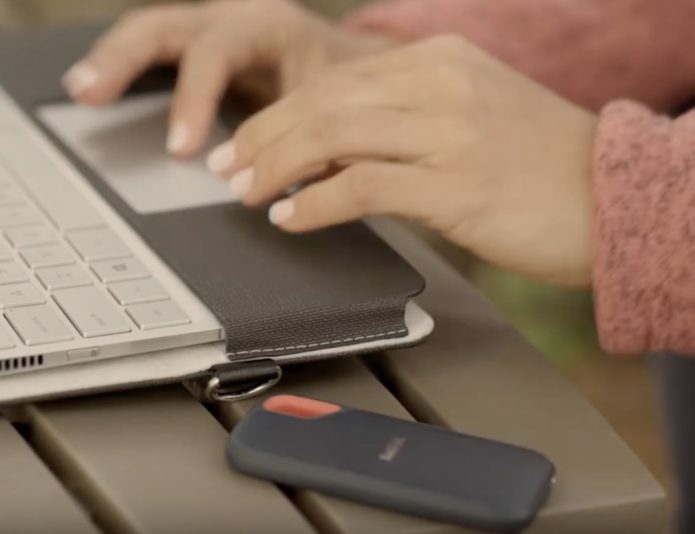 If you’re looking for fast external USB storage, you’ll do no better than SanDisk’s USB 3.1 Gen 2 Extreme Portable SSD. It’s just a tad slower than Samsung’s T5, but one-ups that worthy drive with a svelte and cleverly ergonomic design. 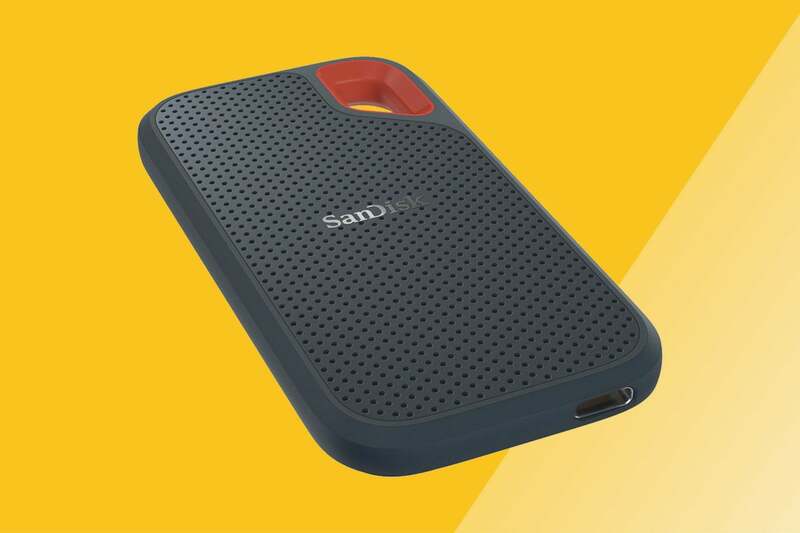 Measuring 3.78 x 1.95 x 0.35 inches, the Extreme Portable SSD is a hair broader and longer than its Samsung T5 and WD My Passport SSDcompetitors, SanDisk’s product is a heck of a lot more practical, though. The Extreme Portable SSD has rounded corners and a textured surface for a very comfortable grip. The shape and feel are unique enough that you won’t have trouble distinguishing it by touch from other items in your bag. There’s also a splash of orange that makes it very easy to spot visually. Kudos to the designer. 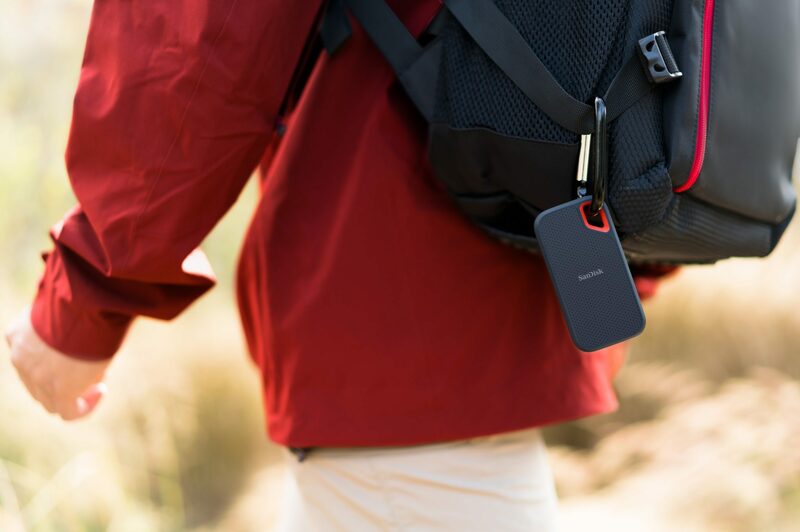 Sandisk may have been going for rugged-outdoorsy with the Extreme Portable SSD, but the result is a pocket drive that’s more practical for any kind of portable use. There is actually one hint as to the device’s purpose, and that’s the USB Type-C port. SanDisk bundles a USB Type-C cable and an adapter so you can still easily attach the drive to earlier Type A ports. The adapter attaches snugly (not all do) and has never shown a tendency to part ways through a couple of months of use. I much prefer the adapter approach to carrying around a second USB Type-C to Type-A cable. Despite the port, the Extreme SSD is IP55 rated to resist water and dust (dry it before use, please) and survive two meter drops. Note that having a Type-C port doesn’t necessarily mean it supports USB 3.1 Gen 2, so check your specs. All modern USB SSDs support Gen 2, but you won’t get full performance if your port doen’t support it. Conversely, there are older Type-A ports that support Gen 2. Thanks USB Implementers Forum! The Extreme Portable SSD is available in flavors including 2TB ($560 on Amazon as of this writing), the 1TB capacity we tested ($270 on Amazon as of this writing), 500GB ($126 on Amazon as of this writing) , and 250GB ($89 on Amazon as of this writing). That’s only a little pricier than bare internal SATA SSDs. Sandisk includes a Windows/macOS app for enabling the password protection and encryption on the drive. The Extreme SSD is warrantied for three years. Beyond that, SanDisk was unwilling to supply a TBW rating (which admittedly does tend to confuse things anyway), or any information about what’s going on inside the drive. 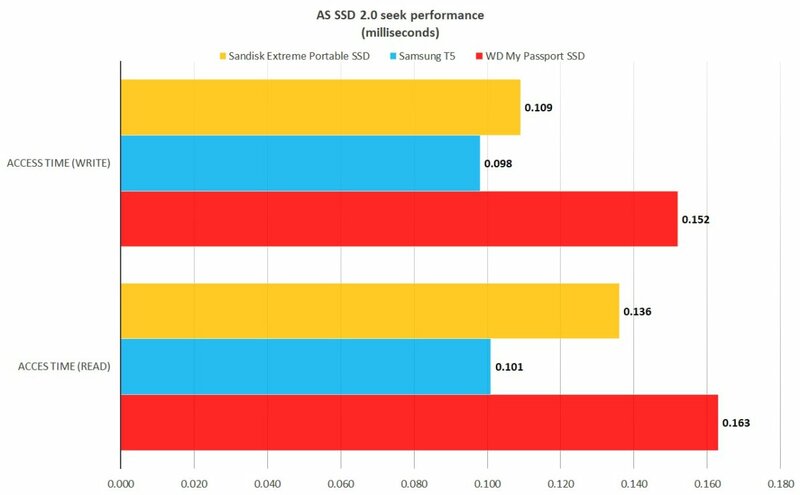 Despite SanDisk’s sparse information about this drive, I can tell you that the Extreme Portable SSD (gold bars) performs almost identically to an internal SATA SSD—a decently fast internal SATA SSD, at that. I ran Ubuntu Linux Live from it, and it was a smooth and quick experience. That said, it’s a bit slower than Samsung’s T5 (blue bars) in some tests, most tellingly in our real-world Windows 10 copies. 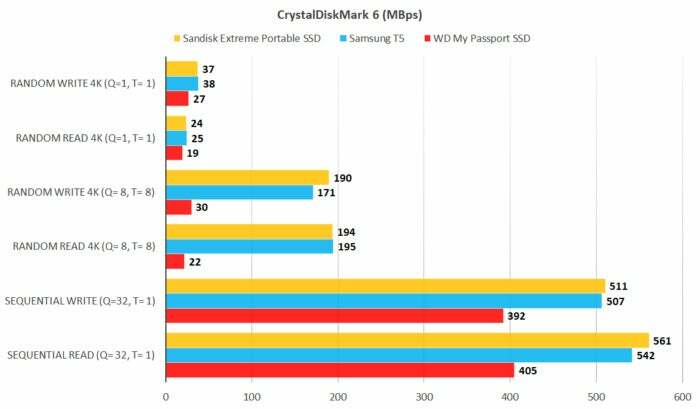 CrystalDiskMark 6 (shown below) rated the Extreme Portable SSD equal to or faster than the Samsung T5. As is quite often the case with CDM, however, the results don’t quite match real-world performance. CrystalDiskMark 6 says that the SanDisk Extreme Pro SSD is just a tiny bit faster than the Samsung T5, though this didn’t carry over into the real world during our long 48GB copy tests. Seek is the measure of how long it takes a drive to find the file or data that you’re looking for. Shown below is AS SSD’s take on it (the Samsung T5 is quicker), though there are mild deviations between each iteration of the test. Though not shown, AS SSD also rated the Extreme Portable SSD’s sustained throughput as slightly slower than the T5’s. Seek times, that is, the time it takes the drive to locate a file, were slower in AS SSD 2.0. Seek is the time it takes to locate a file or data. Shorter bars are better. In our 48GB copy tests, the Samsung T5 proved quite a bit faster than the Extreme Pro SSD. With perhaps as much as a 5 percent margin of error, these tests do show what you can expect when you actually use the drive—assuming you format it to NTFS. If you leave it formatted to exFAT as it ships, you’ll see considerably slower small file write performance. Though it couldn’t keep up with Samsung’s T5 in pure sustained throughput (the large single file copy), the Extreme Portable SSD waxed the WD My Passport SSD. That’s interesting if for no other reason than that WD is SanDisk’s parent company. Shorter bars are better. 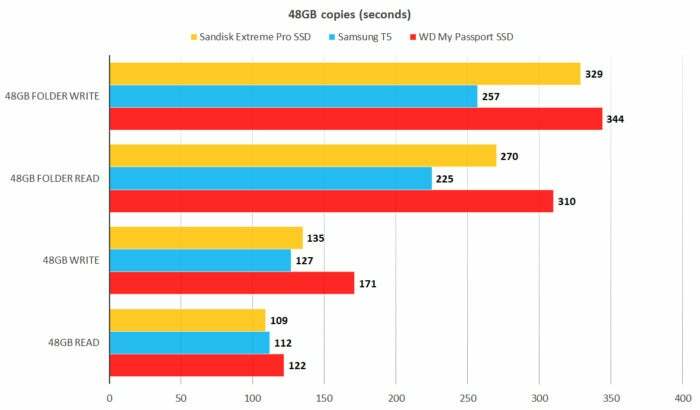 Overall, Samsung’s T5 is a bit faster than the SanDisk Extreme Pro SSD, but both are noticeably quicker than the WD My Passport SSD. When it comes to price and performance, there’s not a whole heck of a lot to choose from between SanDisk’s Extreme Portable SSD and Samsung’s T5. If you’re just looking for a fast drive for backup, the T5 is probably the better bet—it will save you appreciable time over the long haul. If on the other hand, the drive is going to travel, the Extreme Portable SSD is far more practical and comfortable to use. All three of the drives I mentioned are here on long-term eval. The Extreme Portable SSD is the one I always reach for. That little splash of orange really does the trick.